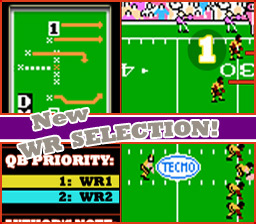 What’s NEW in Tecmo Super Coach? 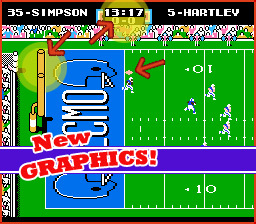 Most importantly, changed in Tecmo Super Bowl is a complete tightening of its legendary football gaming experience, through creating in it specific custom Defensive formations in response to the Offense chosen by the opposing Human or CPU-controlled player. Defensive formations, in combination with a total “Tecmo Super Coach” graphic re-branding, Offensive game play overhaul, and hundreds upon hundreds of hours invested equates to the most complete TSB coaching experience ever! 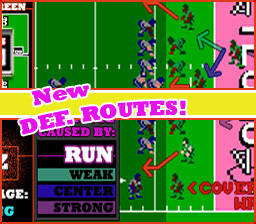 Previously, Tecmo Super Bowl had very unspecific Defensive reactions. Any controller option selected by the Defensive to confront the Offense with was, more-or-less, randomly selected by the player with no notation of what was being chosen, or why. 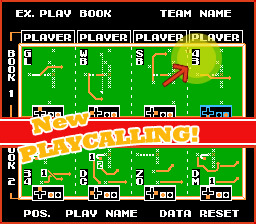 The goal of the original TSB was for the player on Defense to pick the same play as the opposing Offense, which would send all of your Defensive players ‘blitzing’ towards the ball carrier. Ultimately, this feat would be your only true success in the game on the Defensive play-calling side of the ball. What I have done, along with a handful of talented Tecmo Super Bowl enthusiasts, is recode each and every individual player AI reaction so that both Offensive and Defensive sides of the ball work together to create a more fluid football gaming simulation. 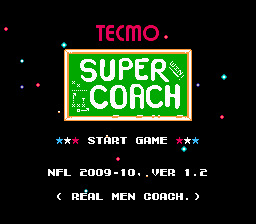 In addition to dozens of visual and functional game engine mechanics, every modification in Tecmo Super Coach has been made to compliment, specifically, the coaching experience of the game, and to provide what I view as a more simplified (some might say ‘chill’) version of a more authentic TSB football experience! Also previously found in Tecmo Super Bowl was a set pattern of extremely sloppy Quarterback AI. As a coaching player, you often didn’t see the kind of results you would have liked in the QB decision-making process. Quarterbacks now scramble less, throw faster, and react quicker to Defensive pressure!